The eggs of various mosquito groups are laid on or near bodies of water. Mosquitoes of the genus Anopheles lay single eggs that float on the waterâ€™s surface. Aedes mosquitoes also lay single eggs; however, they are laid above the water line and are hatched when the water level rises. 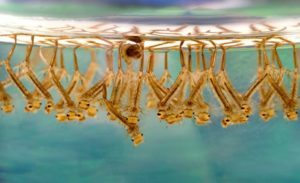 Culex mosquitoes lay their eggs in groups or rafts on the surface of the water. The larvae hatch from the eggs within hours and begin filter-feeding on decaying plant matter. They breathe at the waterâ€™s surface through a specialized siphon tube. Within a few days to several months, they develop into pupae. Pupae are the final non-feeding larval stage that metamorphose or change into the adult form. Pupae also breathe at the surface and require several days to develop. When the adult mosquito emerges, it takes several days to rest and harden its outer cuticle. After about a week, adult females begin searching for a host. The blood meal is used to make a batch of eggs which are then deposited on or near water. The female will then seek another bloodmeal. Although the male mosquito doesnâ€™t seek a bloodmeal, it does require a sugar meal. The females will also sugar feed on nectar between bloodmeals. Adult mosquitoes are alive for several weeks to several months, depending upon numerous environmental conditions.Culex mosquito egg raft. Â A culex mosquito can lay up to 200-300 Â eggs at one time. Â These eggs will hatch in 24 to 48 hours. Â Anopheles and other species of mosquitoes lay their eggs singly on the water. Â Aedes and Ochleratatus mosquitoes lay their eggs singly on damp soil. Culex mosquito larvae hang veritcally in the water breathing from siphon tubes at the surfaceof the water and are constantly feeding. The Anopheles mosquito larvae lay along the surface of the water to breathe, due to their lack of a breathing siphon. 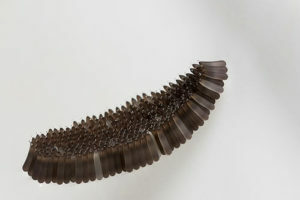 Mosquito pupae (Charles Krebe, 2010.) also live their life cycle in the water and breath at the surface of the water. Â They have a comma-like appearance. Â During this stage they do not eat. This is a photo of a mosquito emerging from a pupal casing below the waterâ€™s surface. From the Pupa (comma-like) stage, it now begins its life out of the water, but first it stands on water, drying its wings and waits for its body harden up.